Human Mesenchymal Stem Cells (HMSC) can maintain multipotency and proliferate extensively in vitro, providing new avenues for cell-based therapy in the restoration of damaged or diseased tissue. Bone marrow is the major blood creating organ, but in addition to supporting hematopoietic growth and differentiation, marrow stromal cells can be induced to produce cells of other connective tissues, such as bone, cartilage, and fat, as well as cells from neuroectodermal (neurons) and endodermal (hepatocytes) lineages. (Click to Enlarge) Human Mesenchymal Stem Cells (HMSC) (A) differentiating into multiple lineages. Adipogenic - Oil Red O staining (B), Chondrogenic - Alcian Blue Staining (C) and Osteogenic - Alzarin Red S staining (D). Tsao, Y., Y. Shih, Y. Liu, Y. Liu and O. Lee. 2017. Knockdown of SLC41A1 magnesium transporter promotes mineralization and attenuates magnesium inhibition during osteogenesis of mesenchymal stromal cells. Stem Cell Res & Ther, 8:39. Tan, C., H. Shichinohe, Z. Wang, S. Hamauchi, T. Abumiya, N. Nakayama, K. Kazumata, T. Ito, K. Kudo, S. Takamoto and K. Houkin. 2016. Feasibility and efficiency of human bone marrow stromal cell culture with allogeneic platelet lysate-supplementation for cell therapy against stroke.Stem Cells Intl, 6104780. Teng, N., Y. Liu, H. Wu, Y. Liu, J. Ho, and O. Lee. 2015. Promotion of Mesenchymal-to-Epithelial Transition by Rac1 Inhibition with Small Molecules Accelerates Hepatic Differentiation of Mesenchymal Stromal Cells. Tissue Engineering Part A. 21:1444-1454. Chang, H., D. Docheva, U. Knothe and M. Tate. 2014. Arthritic Periosteal Tissue From Joint Replacement Surgery: A Novel, Autologous Source of Stem Cells. Stem Cells & Regen Med, 3:308-317. Gadkari, R., L. Zhao, T. Teklemariam, and B. Hantash. 2014. Human embryonic stem cell derived-mesenchymal stem cells: an alternative mesenchymal stem cell source for regenerative medicine therapy. Regenerative Medicine, 9:453-465. Hantash, B. 2014. 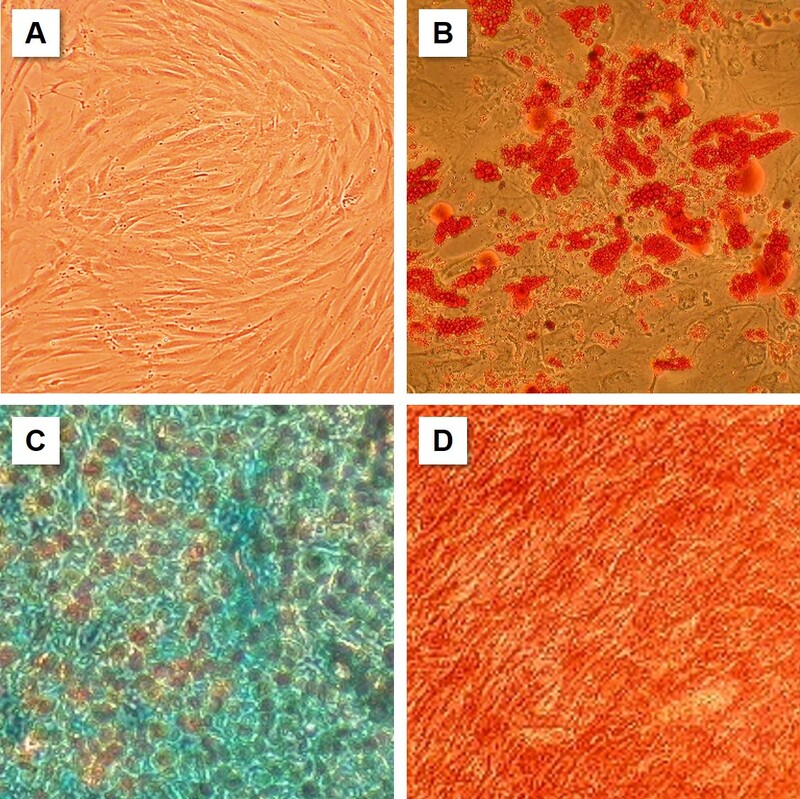 Differentiation of mesenchymal stem cells into fibroblasts, compositions comprising mesenchymal stem cell-derived fibroblasts, and methods of using the same. Patent US8822215 B2. Matsubara, Y., T. Zama, Y. Ikeda, Y. Uruga, T. Suda and S. Matsuoka. 2014. Method for producing megakaryocytes, platelets and/or thrombopoietin using mesenchymal cells. Patent Application US 20160177265 A1. Purandare, B., T. Teklemariam, L. Zhao, and B. Hantash. 2014. Temporal HLA profiling and immunomodulatory effects of human adult bone marrow-and adipose-derived mesenchymal stem cells. Regenerative Medicine 9: 67-79. Teklemariam, T., B. Purandare, L. Zhao, and B. Hantash. 2014. Inhibition of DNA methylation enhances HLA-G expression in human mesenchymal stem cells. BBRC 452:753-759. Purandare, B., T. Teklemariam, L. Zhao, and B.M. Hantash. 2013. Temporal HLA profiling and immunomodulatory effects of human adult bone marrow- and adipose-derived mesenchymal stem cells. Regenerative Medicine. 9:67-79. Kato, Y., I. Hirata, and M. Kanawa. 2012. Animal Cell Culture Kit, Method for Culturing Animal Cells, Method for Selective Culture of Animal Cells and Cell Differentiation Method. Patent Application US 20140030804 A1. Hirota, Y., and M. Hakoda. 2011. Relationship between dielectric characteristic by DEP levitation and differentiation activity for stem cells. Key Engineering Materials. 459:84-91. Park, J., H. Yoon, B. Yoo, Y. Kim, and Y. Shin. 2011. Method for the preparation of dermal papilla tissue employing mesenchymal stem cells. Patent US 8017390 B2. Tedder, M.E., A. Simionescu, J. Chen, J. Liao, and D.T. Simionescu. 2011. Assembly and testing of stem cell-seeded layered collagen constructs for heart valve tissue engineering. Tissue engineering. Part A. 17:25-36. Zhao, L., and B.M. Hantash. 2011. TGF-b1 Regulates Differentiation of Bone Marrow Mesenchymal Stem Cells. Vitamins and hormones 87:127-141. Tedder, M.E.B. 2010. Characterization and Evaluation of a Novel Tissue Engineered Aortic Heart Valve Construct. Clemson University, PhD dissertation. Tedder, M., A. Simionescu, J. Chen, J. Liao, and D. Simionescu. 2010. Assembly and Testing of Stem Cell-Seeded Layered Collagen Constructs for Heart Valve Tissue Engineering. Tissue Engineering Part A., 17:25-36. Le Visage, C., S.W. Kim, K. Tateno, A.N. Sieber, J.P. Kostuik, and K.W. Leong. 2006. Interaction of human mesenchymal stem cells with disc cells: changes in extracellular matrix biosynthesis. Spine. 31:2036-2042.